This four-bedroom Mykonos villa with private pool and incredible sea view is in beautiful Elia Beach. Villa Alice is characterised by its design which fits perfectly into the rough Mykonian landscape whilst offering guests a peaceful place to relax and enjoy. The villa in Mykonos features open-plan living areas with shaded pergolas and a swimming pool with overflow. Just a short distance from the cosmopolitan beach of Elia and with magnificent views of the Aegean Sea, you’ll find the beautiful Villa Alice. With its own a private swimming pool, the villa is located 10km away from Mykonos Town. All the furniture and fittings that makeup Villa Alice’s character are carefully chosen for their style & quality. Signature furniture gives guests a wonderful experience. Furthermore, Villa Alice is environmentally friendly as 85% of its assets are fully recyclable and its energy efficient devices mean the villa has a low environmental footprint. On the entrance level you’ll find a large living room with cosy indoor dining area plus a modern and fully equipped kitchen. There’s also a large dining terrace with pergola as well as an outside lounge area which offers breathtaking sea views. On the lower level you’ll find a master bedroom with a king size bed and en-suite bathroom. There are a further two bedrooms – one double and one twin. You’ll also find a fourth single bedroom. There’s also a bathroom, a kitchenette and a shaded play area. We can arrange a host of other services for you including private chefs to visit the villa to cook, dry cleaning services, luxury cars and minibuses to transfer you from the airport to the villa. We also arrange security services for our VIP clients as well nanny services. Hiring a yacht or taking a day trip to Delos is something we recommend and you can also arrange helicopter rides or romantic dinners with us. 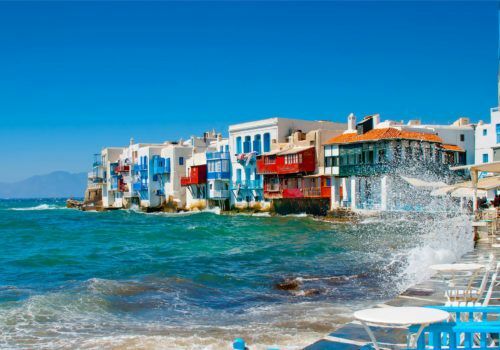 Mykonos is fast becoming the go-to destination in the Greek Islands. With its relaxed vibe and cosmopolitan island life, it’s an ideal location for relaxing with friends and family. 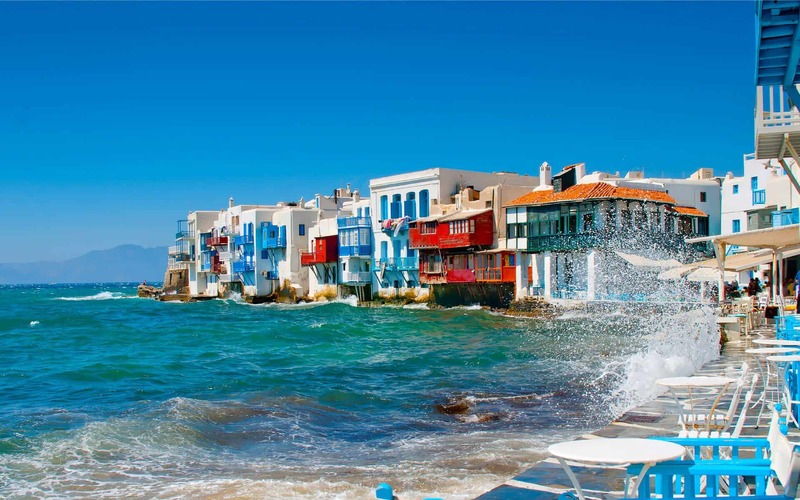 Nearby Mykonos town has cobbled streets with many quaint tavernas, bars and boutiques. A favourite destination for Jackie Kennedy Onassis, it’s overtaken neighbouring islands to be the destination of choice. If staying in a villa, we recommend hiring a car on your trip as well so you can explore the area, visiting some of Mykonos’ renowned beaches like Elia and Paradise. Enjoy Jackie O’s beach club at Super Paradise and try some of the incredible restaurants in Mykonos Town and at Psarou Beach.